The incident occurred on January 2, 2016 on the Orenburg-Orsk highway. Russian law enforcement officer Danil Maksudov, put himself in harm’s way in order to help save people during a particularly bad snowstorm. Now he is a real hero in the eyes of many Russians. In the film “Armageddon” protagonist Bruce Willis remains on a meteor to blow it up and prevent it from colliding with Earth. In “Star Trek” Capitan Spock sacrifices himself in order to save an interplanetary spaceship. But sometimes in order to save someone's life it is enough to do something as ordinary as giving your warm clothes to a person at risk of freezing to death. This is exactly what a 25-year-old patrol officer did. The incident occurred on January 2, 2016 on the Orenburg-Orsk highway in the southern Urals region of Russia. That particular area is famous for its horrible snowdrifts and snowstorms. On that day hundreds of people found themselves in a long traffic jam lasting several miles. 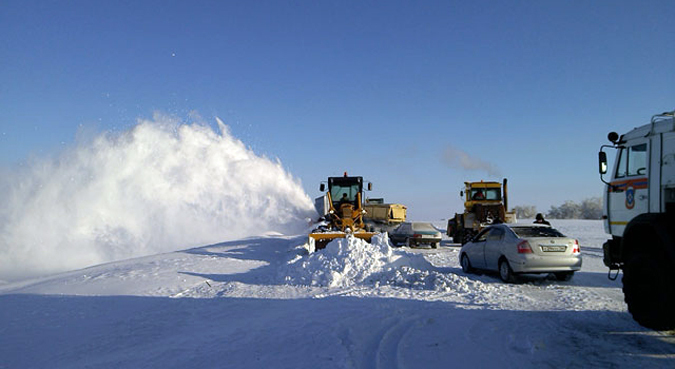 Over the course of 15 hours drivers could not move due to the 150-kph wind (about 93 mph), heavy snowfall and -30 degree Celsius (-22 Fahrenheit) temperatures. Workers from the Ministry of Emergency Situations and policemen carried out the rescue operation: 84 people were rescued and 14 were hospitalized. One person was found frozen to death and one woman died at the hospital. Danil Maksudov. Photo by Russian Emergency Ministry. Maksudov managed to save another young man and hand him over to doctors. All of these people are currently being treated in a hospital. The policeman himself had severely frostbitten hands. Right away doctors considered amputating them, but promised to do everything possible to save his left hand. In the end surgical intervention was necessary and Maksudov’s little finger and part of his ring finger on the left hand were amputated. According to the local media, Director of the local Ministry of Interior Division Police General Mikhail Davydov has ordered the preparation of documents so that Maksudov would receive a medal. Dozens of Russians have left words of support on Maksudov’s VKontakte page, a popular Russian social media site. According to his colleague Vladimir Firyulin, Maksudov has refused financial assistance and sees nothing extraordinary about his deed. He is very modest, does not speak with the press and does not consider himself a hero.